Know someone who says that all the time? Perhaps yourself? I used to be that person. Used to feel very unlucky, just about all of the time. At some point, things changed. I landed a great job right out of college, one that I’ve been able to rely on ever since. I realized that my friends – all of you – are the very best ones a girl could wish for. Heck, I realized that people actually wanted to be my friend. I met a boy, a dreamy, perfect catch who I wanted to spend my life with – and he wanted the same from me in return. I chose a hobby (this one) and I’m told it actually makes a difference in people’s lives. Not only do I feel lucky that I get to share my food with more people, but also that I get to be part of a healthy-food-lovin’ community where everyone is excited about fresh, wholesome ingredients just like me. I find myself highly anticipating the moment Clean Eating arrives in the mail, and not only that, I get so excited about all the new recipes at my fingertips that I have trouble deciding what to make first. This is one of those recipes. Or rather, my adaptation of one I saw with endless opportunities to fit into one’s personal likes or dietary needs (and I’ve listed out those possibilities in the recipe notes that follow.) And that’s just part of why I love this recipe. In addition to being so versatile, it comes together with a short list of nutritious, wholesome ingredients. It’s quick and simple to prepare. But most of all, it’s delicious, and an unexpected twist to your normal pasta routine (if you have one.) Now, don’t you feel lucky? Speaking of getting lucky, remember to enter my giveaway for Tropical Traditions Coconut Oil! Meanwhile, mash the avocado with a fork and mix with the lime juice, yogurt, and salt until smooth. When the water boils, add the pasta and cook according to package directions. Drain, return to pan, and add the avocado mixture. Stir to coat, and set aside. Meanwhile, heat a large nonstick skillet over medium heat. Cook the onions, red pepper and yellow pepper for about 7 minutes, until softened. Toss the shrimp with the Southwest seasoning, and add it to the pan along with the garlic. Cook for 2-3 minutes more, turning the shrimp once, until the shrimp are opaque. Turn off heat. Divide the pasta among serving bowls. Top with equal portions of the shrimp and vegetable mixture. Sprinkle with the cherry tomatoes and cilantro. 1) Feel free to use whatever kind of pasta you like and suits your diet, whether it’s whole wheat, low-carb, gluten-free, etc. I used Carba Nada Reduced Carb noodles. Because nutritional information might vary based on brand and type of pasta used, I have omitted this from the nutritional information. If you are counting calories, points, macronutrients, etc, be sure to add your choice of pasta to the nutritional counts for your meal. 2) Don’t eat dairy? Try substituting 3-4 tablespoons of light coconut milk. 3) If you don’t eat shellfish, try this with grilled flank steak. For a vegan option, make this with black beans or cubed, baked tofu. I feel lucky after reading this recipe, that's for sure! I made a pesto out of avocado awhile back and I've been wanting to make an avocado pasta sauce again…score! Looks AHmazing!! One question, did you use raw or cooked shrimp? That is a droolworthy dish! I really like quesadillas and should try it with shrimps. I love ALL these components. 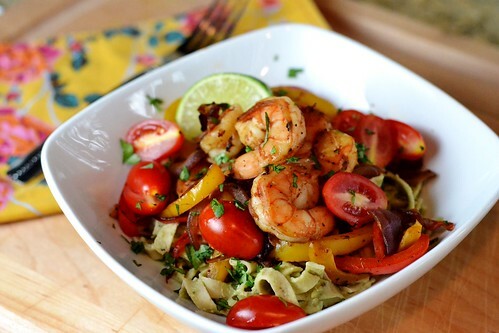 creamy shrimp pasta dishes are so comforting! Thanks Nathan! I always use raw shrimp – if you start with cooked shrimp and follow these instructions, I think the shrimp will turn out overcooked and tough. Thanks Emily! I think one of the thigns I love about this dish is that it does have that creamy, comforting feel – yet still very light and flavorful for summer. I have a little one who counts shrimp, pasta, avocado and tomatoes among his very favorite foods. I am definitely going to give this a try, as we all would love it! Since you don't do pasta very often, it is nice to see you share such a delicious sounding (and pretty!) one. I love the Mexican angle to a pasta dish (which 99% of the time are Italian). Looks fresh and delicious! :0PS – I'm hosting a really awesome giveaway, today only! Check out Healthy and Sane for a chance to win. It's a really good one!! Mmm this looks delicious! Thanks for including the substitutes. 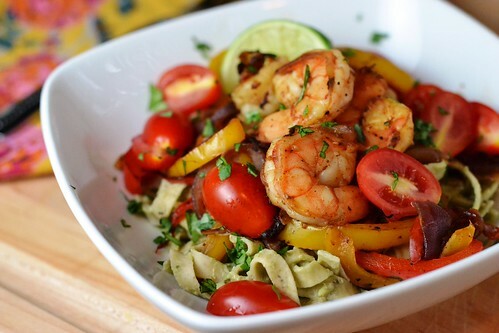 I don't eat shrimp but shrimp recipes always look so yummy. I'll probably try it with the tofu! This looks delicious. I know my husband and I would both love it! I can't believe you being an unlucky person! Cara, this recipe looks amazing! My kids would devour this. I have some delicious Argentinian Red Shrimp right now in my freezer that would be perfect for this! Great idea!! We hardly eat pasta either, but I really like the nutritional profile on that Carba Nada. I'm not sure what your dietary needs are, but it might be worth checking out! My mom is always trying to tell me that things that happen in my life are "lucky". I try to explain to her that really, most of what she's talking about isn't luck…it's hard work and dedication and I think the same applies to you and this gig! You rock…which isn't lucky, it's just a fact. Love this dish! Quesadilla in pasta form = heaven. Oh, I definitely have a normal pasta routine. Would love to work this in, but I usually don't make shrimp at home because Jeff is allergic… I'm sure I could sub something in though. It sounds incredible to me! This sounds perfect! I think Tom would especially like this one. Yum! This looks and sounds incredible. I love this style of food, and this presentation is amazing. Cara, that is AWESOME news!! Congrats on the Clean Eating writing gig. Can't wait to see your recipes in there. Great reflections and delicious sounding recipe. Yum. I remembered seeing this recipe a while ago on your blog and made it today. I really like the avocado cream sauce. I made some modifications to the recipe. I added a little cumin and chili pepper to the cream sauce. I also addedspicy chicken sausage(no nitrate or preservatives or casing) and halfed the shrimp amount.I like it spicy!! I also added Trader Joe s frozen fire roasted corn. Very versatile yummy recipe. Definitely a keeper. This is being added to my grocery list! Thanks Ashley – so glad you liked it!